Spring has finally arrived (well, in the Northern hemisphere) and we can rejoice in the fecundity of nature as temperatures warm up and everything starts to bloom. As well as the spectacular blossom, budding leaves, tulips and magnolia, the new season also heralds the arrival of some wonderful local produce in the UK. Of course, market forces allow us to basically eat anything out of its natural seasonality, grown from anywhere in the world. That’s great and a wonder of man’s ingenuity, but I want to focus on eating in synch with the rhythms of nature as we have been doing for generations, before Gaia was turned into a factory. Eating 100% seasonally would be pretty dull indeed, especially in winter! However, it is nice to get an understanding of when certain crops are harvested, therefore being in abundance and found locally. This produce should in theory be cheap, plentiful, varied and of prime quality as it doesn’t have to travel halfway across the world (Alas, many of these rules no longer hold true due to the complexities of agricultural economics). To me, Spring is associated with fresh and verdant vegetables: think peas, broad beans, artichokes, spring onions, wild garlic, broccoli and asparagus. British asparagus, definitely something to get very excited about here in London! 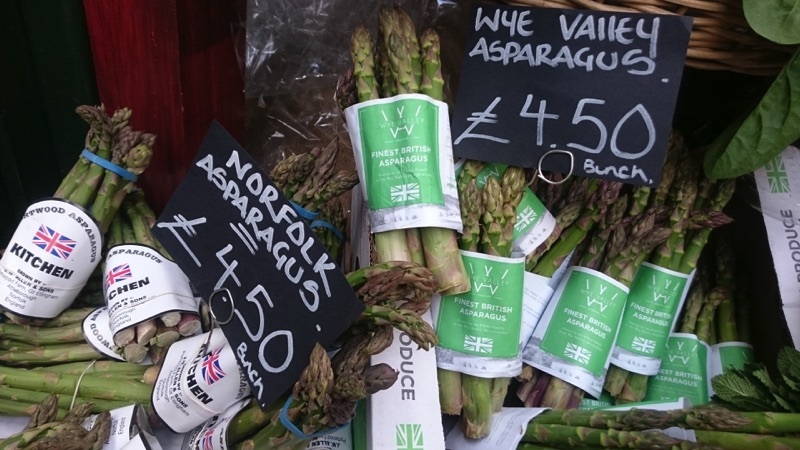 I am very happy to announce the start of the British Asparagus season (well I have seen it in Borough Market for a few weeks, but the start date appears to be 23rd April, St George’s Day) and I urge everybody to try some! So why am I and many others so excitable about British Asparagus? All vegetables continue to respire after picking: and during this process the nutrients are broken down, in turn leading to the deterioration of flavour, texture and nutrients. Enzyme and microbial activity also contributes towards this. Asparagus is a vegetable that rapidly deteriorates upon picking, partly due to a very high respiration rate (five times as high as potatoes and onions): like peas the sugars rapidly breakdown into starches. By the time the all year round Peruvian asparagus gets to us, even with the fastest time from field to fork, it has been sat around for a whole week, probably longer. In this time, the vegetable is a poor relation to the that which was picked. Much of the sugar has turned into starch, as well as the degradation of a whole host of other nutritive and flavourful compounds. Also, note, as is the case for most long haul produce, the food industry selects not for flavour, but for much more practical concerns such as its ability to withstand the long voyage. At this time of year proudly grab your bunches of British Asparagus and eat them immediately! Cherish this two month window from the end of April to midsummer: crisp, fresh, sweet, nutty, tender stems of deliciousness. Remember, we don’t need to gild the lily: the simpler we treat this special treat the better. In the spirit of this, I am not going to give you a recipe today. Instead I am going to talk you through griddling asparagus, my favourite current method in some detail. I believe that often the things that appear the simplest from a distance, are in fact anything but, particularly if we are aiming for perfection above mere mediocrity in our chosen pursuit. In the kitchen we can experience mindfulness (I know, shame on me to hang off the coat-tails of this particular zietgiest!) when we are at one with our ingredients. Take a few deep breaths and let’s get our mise going (mise en place). Assemble your ingredients and utensils so that they are to hand: asparagus, olive oil, salt pepper, griddle pan, bowl. Good to go? Great! A few more deep breathes: get to know your primary ingredient. How does it feel in the hand, the weight of it? Smell it, observe the wonder of nature. If the spears are on the larger side, it is best to cut off their woody stems. This is fairly simple: if you hold each spear between your hands towards the bottom it will naturally snap off leaving the woody part to discard. Take the spears and place them in the bowl: add a drizzle of olive oil, mix the spears. Season well with salt and pepper and mix again. Again, focus on the task at hand. Marvel at the wonders that the oil and seasoning will do to this vegetable. By doing this in the bowl and adding the oil first we are ensuring that flavour gets in there and that the seasoning sticks effectively! 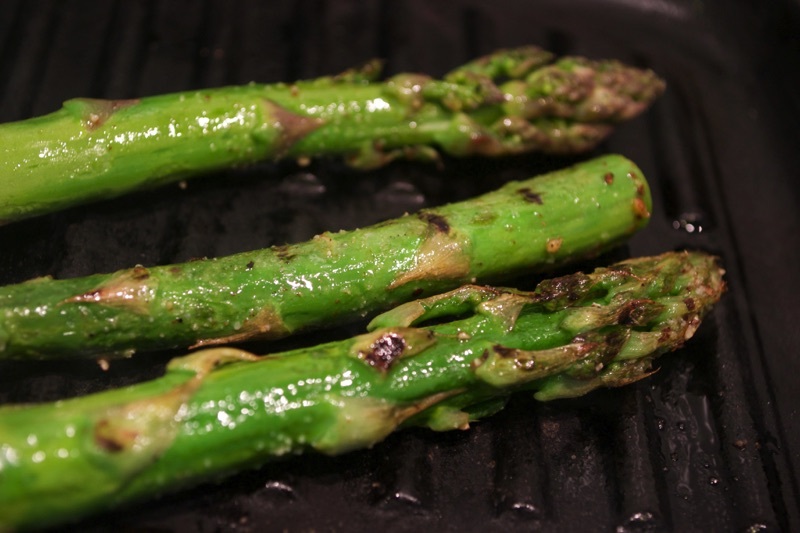 Get your griddle pan on your hob and heat it up to a fairly high heat: once hot, add the asparagus. Wait and you should see, smell and hear the changes happening! The aim is to get a nice sear on the outside of the asparagus, some charcoal flavour, whilst the middle is tender and hot, but still retains a bite and its nuttiness. Continue checking and turning the asparagus from time to time to ensure that you char it evenly and so that the middle is cooked. Remove from the pan and enjoy! I love it on its own: you could equally pair it with a really good quality, fresh poached egg or two with golden, rich yolks to dip the spears into, maybe some lovely hollandaise, perhaps some shaved parmesan, prosciutto, or whatever else pleases! For more British Asparagus inspiration, check out the rather lovely British Asparagus website.